And so 2014 comes to a close (about an hour from now in Japan time as I write this) and what a year it has (and hasn't) been! 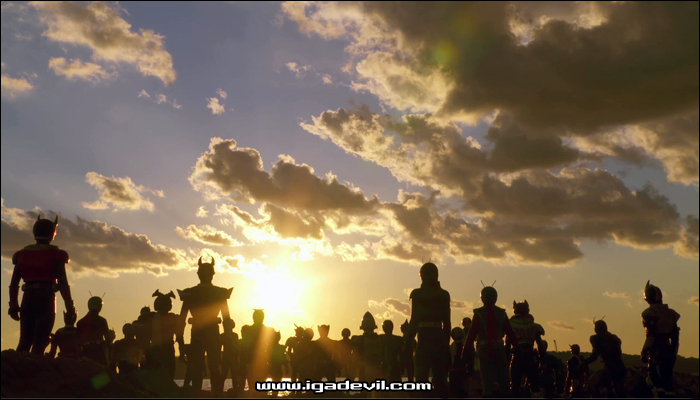 But there is a sense of regret as things come to a close, because this was honestly a pretty great year to be a Kamen Rider fan. On TV, at the movies, and most importantly, on the toy and book and video shelves, it felt like someone was tapping directly into the dark recesses of my mind and coming out with movies where Ryō Hayami drives up to deliver lines opposite Kamen Rider Faiz, or they're making toys based on Ultraman vs. Kamen Rider. What an age of wonders we live in! But a new year is on the horizon, and with it comes a renewed drive (sorry) to push on. Even when real life wears me down, like Taki taking a vicious suitcase beating from a giant flying squirrel-man, I never want to give up. There's so much stuff I want to do, so much stuff I've started that needs finishing, and so many more exciting things in the pipeline I haven't even hinted at. Can I make it happen this year? Will 2015 be the Year of the Igadevil (we'll think of a better name later)? I dunno, but the next part of the story starts real soon, and I'm going to do everything I can to make it an exciting one. Thank you for sticking with me on this crazy journey so far, and I wish you all a safe and happy New Year. Let's hope it's a good one. I found your podcast recently and have been a casual Kamen Rider watcher for many years (really started during Faiz). I was wondering if you were looking for people to host with regularly since I think it would make for great content for Kamen Rider fans everywhere. Thanks for all of your hard work and good luck with the new year!